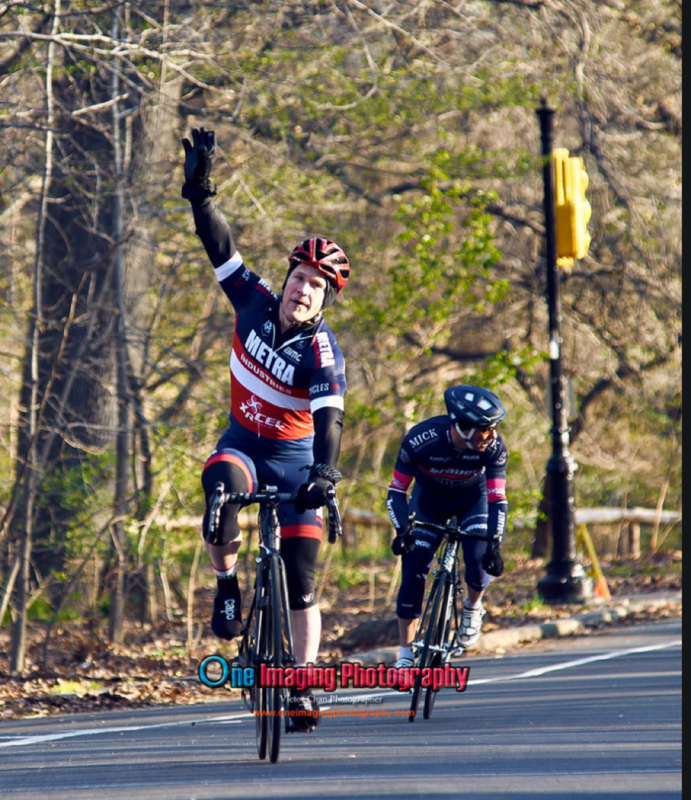 My teammate Adam Pantastico and I raced the first event of the Castelli series race last weekend (on April 15 2017) in Prospect Park (Brooklyn NY). It was a good day for us with Adam taking 7th and me taking…well…read on. There were 92 pre-registered so I’m guessing we had a full-field of 110 starters. I have to say that promoter, Charlie Isendorf consistently, year after year, knows how to put on a good, well organized race. He keeps things flowing seamlessly and he keeps things exciting. The series has an Overall Leader’s Competition, a KOM competition (announced randomly during 2 laps of the race) and a Sprint competition (also announced randomly during 2 laps of the race). Some cool frills come along with these laps (essentially a “race within a race” so to speak) — huge green flag is waived with the bell lap for the sprint and a huge polka-dot flag is waived for the KOM laps. They are HIGHLY contested laps. Each leader gets their respective leader’s jersey (actually a very nice quality, full on kit) + at the end of the entire race series, a big trophy and even bigger bragging rights to the ultimate, overall winners. And then, of course, the Overall champion ends up getting the Yellow Leader’s kit, a big yellow trophy and some descent bucks and/or high valued merchandise. In this race, although there were numerous breakaway attempts, none of them lasted. So it came down to a bunch sprint. With approx. 1 mile to go in the race, we were approaching the hill which precedes a 200-yard false-flat that takes us to the finish line. I positioned myself well as we approached the base of the hill. As we began to climb, I elbowed my way through the masses and got myself into 10th or so. The speeds ratcheted up and I noticed, ever so slightly (as the lactic acid burn in my own legs was setting in) that the guys around me beginning to fatigue. Approx 2/3 of the way up the hill when it began to hurt the most, I knew it was time…I gunned it and blasted out of my saddle with all I had knowing it would (a) either demoralize the others who were hurting equally a s bad OR, (b) that it would result in the leadout to the final finish line sprint. After giving a hard dig for what seemed like an eternity, I looked over my shoulder to see that it was the former…I opened up a sizeable gap on the next guy…I was clear…but the finish line was still far enough ahead where there remained much work to be done. I put my head down once and plowed forward with another thrust…all I had. I looked over my shoulder to see they were still there and not able to rationalize a sense of depth perspective from everything burning by now (as to whether or not I was far enough ahead or if they could catch / pass me)… I gave one more head down, full blast. After that, I looked over my shoulder one last time to see what I was hoping for…enough room to sit up and salute crossing the finish line…taking the win!! There remains a long way to go in this series…as for now, I am in the coveted yellow jersey as the overall leader. Fast forward to one week later…I contested another race on this sam e course – April 23, 2017 – but not part of the series that I am the overall leader on. It was a sell-out race with the maximum capacity of 110 preregistered racers…the dynamics in this one were ENTIRELY different than last week’s. The only things that were consistent was the ferocity of the competition, the brutally early start time of 6 AM and the little bit too cold for my liking (upper 40’s) temperatures. The avg speed was just under 26 mph and the race length was 42 miles. This time there was a 12 or so man breakaway established early on in the race…I managed to work my way up into that group…I thought for sure it wouldn’t last because it wasn’t as well organized as it should be. And, it occurred early on in the race. There were 2 or 3 guys that just weren’t working, and as a result, disrupting the “flow” of our pace line. It was uncertain as to whether they were just sandbagging and sitting back to save energy for the final sprint, or if they were too hurting to take a pull and work…the beauty of our hard-driven pace-line answered that question. As the miles continued, the group dwindled…those who weren’t pulling and doing any work were disappearing. At the end, we were left with only 8 or 9 guys in our breakaway group as we shed the guys who weren’t strong enough to hang. Glenn is heading off to do the Nationals in Colorado this coming weekend. Good Luck to you GLENN! !